It has been said that this time of year is the most wonderful time of year. And regardless of who exactly said that, we happen to agree. Especially in our beloved Houston, where some bright and merry cheer is the perfect cure to help heal us from a rough 2017. Whether you’re getting lit at the Heights annual block party, trying to impress a date with your outdoor ice skating skills, dusting off last year’s questionable sweater for a bar hop, or flying down a slide made of ice that’s probably (read: definitely) meant for kids, these festive happenings are sure to put you in the holiday spirit. The Magical Winter Lights lantern festival is not not a good place to take your Tinder date. Stroll the Magical Wonderland, get nostalgic riding classic carnival rides and playing old-school games, and hit up the Holiday Market for some early shopping. Hours are Sunday-Thursday from 5pm-10pm and Friday-Saturday from 5pm-11pm. Moody’s holiday festivities include the Festival of Lights, outdoor ice skating, cirque shows, and a big ole arctic slide. The Festival of Lights will open at 6pm and Ice Land opens up at 10am. There will also be train rides, a ton of food, and live entertainment throughout. Definitely family-friendly. Cost: Tickets range from $10.95 to $109, depending on the pass/attraction. Zoo creatures will be stirring as the Houston Zoo gets lit up with over 2 million LED twinkles for the holiday season (that’s 15 miles worth of lights!). Stroll the park and grab some make-your-own s'mores and craft beer while you’re at it. There’s also going to be hot chocolate as well as dinner plates served by Macaw Cafe. Cost: Hours are 6pm to 10pm on value nights ($11.95-$16.95) and 6pm to 11pm on regular nights ($16.95-$19.95). You can even try the Pamchenko (it's not too dangerous)! Even if you fail miserably, you’re still ice skating outside in the largest rink in the Southwest, which is pretty cool. The ice rink is even more fun at night when they blast it with some lights, so be sure to check out the website for hours and admission prices. Cost: Ranges from $8 to $17. Fluff Bake Bar’s Rebecca Masson will be whipping up Dutch apple and pumpkin pies for a special by-the-slice pop-up. Get them alongside fresh-off-the-grill chicken wings (and some whiskey, of course), beginning at 5pm. Cost: Pie slices are $4; chicken wings are $15. Conquering the 5K or 10K Turkey Trot before you literally stuff yourself with stuffing is the least you can do. The races starts bright and early, with stages beginning from 7:20am to 9am. This year's starting line begins on Sage and Richmond. Father Christmas and his merry elves will unwrap the magic of the Yuletide season at the Texas Renaissance Festival’s closing weekend. Feast like a king, slosh flagons of mead, wander the winter wonderland, and get rowdy after dark. The festival opens with the sounding of the village cannon at 9am and closes at 8pm with a royal fireworks show. Cost: Adult admission is $23.95 plus $2.50 processing fee or $30 at the gate, with group rates, camping and parking passes, and After Dark options available. You have the option of chopping down Leylands, Murrays, and/or Blue Ice at this choose-and-chop Christmas tree farm, which also boasts some very cool lights. The farm sits about 45 minutes outside of Houston proper and also has some fun and games for the kids if you want to make a day out of it. Cost: Trees range from $25 to $250, and hours vary by day. Treat yourself to a night at the ballet with the Houston Ballet’s annual hometown tour of the Christmas tradition. Shows run at 2:30pm and 7pm and are approximately two hours long with an intermission. Cost: Tickets are $35 and up. The Alley Theatre returns home with a Dickens’ classic: A Christmas Carol - A Ghost Story of Christmas. Days and showtimes vary, so be sure to check the website. It’s also one of Houston’s favorite plays, so book up quick. Cost: Tickets are $28 and up. Cozy up for a screening of National Lampoon's Christmas Vacation in the park. You can bring blankets, and food/drink (including beer) will be available from the Lake House. The free showing starts at 7pm, and those who want to skate can do so for a fee. The Mayor’s annual holiday celebration comes complete with Santa, fireworks, and the festive tree lighting in the heart of downtown.The event takes place in front of City Hall from 6pm to 8pm and is free and open to the public. The shops along 19th Street join together for this annual holiday celebration, complete with roaming Christmas carollers, in-store festivities, booze, and REAL SNOW! Hit it up from 6pm to 10pm. Pop Shop Houston’s annual Holiday Festival is a choice way to get your holiday gifting done early. Expect local, handmade, fair trade, and vintage goods. The events kick off with a preview party from 6pm-10pm on Friday, followed by the festival from 10am-7pm on Saturday and 11am-4pm on Sunday. Cost: Passes start at $8. Ever want to transport yourself to 9th century Victorian London -- complete with carolers, bagpipers, roaming musicians, and holiday food and drink -- during Christmastime? 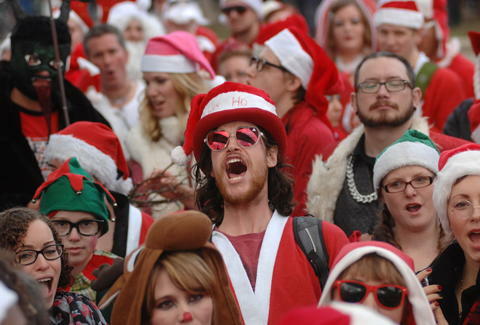 Well, you can at the island’s eccentric holiday street festival. Start on Friday beginning at 5pm (with free admission) and follow with full days from 10am to 9pm on Saturday and noon to 6pm on Sunday. Cost: Tickets are $13 to $15 for adults and $7 to $9 for children ages 7-12 for Saturday and Sunday. Want to pay half price? Show up in Victorian costume. In Houston, tamales are a holiday tradition... one best celebrated with a tamale-eating contest at Tamale Festival Houston. Doors open at noon. Cost: Tickets are $10 pre-sale and $85 for VIP. It may be itchy, it may be ugly, but all those worries go away when you imbibe with your fellow ugly sweater-wearers at the 2nd Annual Downtown Ugly Christmas Sweater Pub Crawl. Tickets are $30 (look out for sales) and gets you access to drink specials at the bars, plus a cup and koozie. 3pm to 9pm. Saint A and Sonoma are teaming up for a beer, cheese, and wine tasting complete with holiday treats. The lineup includes Christmas Ale, Bishops 12 (Christmas Ale aged in sauvignon blanc barrels), Bishops 19 (Christmas Ale aged in chardonnay barrels) and Raspberry AF (beer made with raspberries), plus sauvignon blanc, chardonnay, and a selection of cheeses from the Houston Dairymaids. Taste it all from 2pm to 5pm. Cost: A very reasonable $25 a person. Spike your cocoa for a screening of Home Alone under the stars. The free showing starts at 7pm, and those who want to skate can do so for a fee. Bring blankets and whatnot. Tomball’s annual German Christmas market rocks street vendors, polka music, lederhosen, and the ceremonial tapping of the Christmas keg, as is tradition. Admission is free and the hours are 6pm-10pm Friday, 10am-10pm Saturday, and 10am-6pm Sunday. Parking pro-tip: definitely take advantage of the free shuttle. 'Tis the season to fill your flask with warm cider and get merry and bright at the annual block party, Lights in the Heights. The street party runs from 6pm to 9pm, but the revelry at neighboring bars goes well into the night. Cost: Cash for the bar once the street party shuts down. Bring a blanket for this holiday edition of Market Square’s movies under the stars. The free show starts at 7pm, and you can buy booze and eats from Niko Niko’s (because no one ever said gyros weren’t movie snacks). The Houston Symphony Chorus, soloists, and orchestra perform the annual holiday tradition, Handel’s Messiah. Shows begin at 8pm on December 14-16 and 2:30pm on December 17. Cost: Tickets start at $29. The Bayou Bend Collection and Gardens gets into the holiday spirit with carolers, faux-snowballs, a trail of lights, and 14 acres of festive beauty. Christmas Village is open every evening except December 24, 25, and 31. Hours are Sunday-Thursday from 5:30pm-9pm and Friday-Saturday from 5:30pm-10pm. Cost: Tickets are $13 to $18. This is a 5K and half marathon with Christmas cookies and merry tunes. The race starts at 7am and registration is $40 to $60 for adults. For the kids, 100-yard Santa Sprints for $5 and one-mile Rudolph Runs for $10 are available. Cost: Varies from race to race. For 12 days in December, Picos will be featuring a different mole each day, culminating with a massive mole and tamale brunch buffet on Sunday from 10am to 4pm. The brunch costs $32/person, and you can expect a ton of mole offerings and more than a dozen assorted tamales and sides. Bring refreshments and other appropriate merriments as you ride the Houston Wave and check out the most spectacular light setups around the city. Meet by the benches at Market Square Park to check in between 5:15pm and 5:45pm. Cost: The tour costs $35 per person. The nightclub opens up for a Naughty or Nice Ball on the eve of Christmas Eve, complete with dance music from Party Favor, copious amounts of flowing booze, and VIP sections. Cost: $10 for GA, and the party goes all night (10pm to 2am). Don't be a cotton-headed ninny-muggins! Instead, spread the holiday cheer with a screening of Elf under the stars.The free showing starts at 7pm, and those that want to skate can do so for a fee. Lucky’s annual New Year’s Eve BLT (black tie, lingerie, toga) party is always one for the books. Cost: Ticket prices are still TBD, but bookmark the website and keep checking back. Brooke Viggiano is a Houston-based writer who is likely busting out her faux Christmas and Hanukkah trees as we speak. Celebrate the season with her @BrookeViggiano.